My Sims love variety so more edible food the better lol. New Meal for your Sims 2 enjoy! They'll need to use the oven to create this dish and it even gets it's very own menu item on the Sims Pie Menu so no need to go looking for it under a meal time category. Not sure what EP is required to use it but it looks as though the creator cloned the chips platter from FreeTime. It's what it looks like anyway. I recommend when you extract the ZIP file you extract it into it's own folder so all the files are neatly kept together, it needs all 3 files to work. Enjoy! Its a nice looking site too. Very clean. 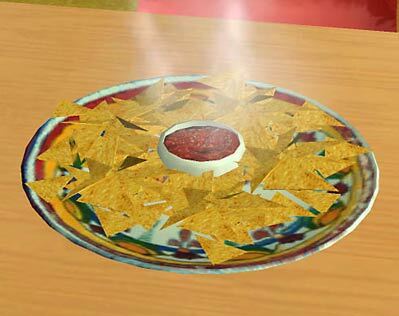 I absolutely love the look of this nacho dish for my TS2 Sims. I just wish the link wasn't broken, otherwise, I'd download it in a heartbeat.